Housing turnover, especially the one originating in the renter-occupied segment, leads the business cycle and real house price movements. The only ﬂow category out of the four that is unrelated to overall economic activity is moves from homeownership. Perhaps surprisingly, these moves are not just older households downsizing for retirement. Altogether, the turnover rates between the two housing market segments display a rich and varied dynamic correlation pattern with overall economic activity: moves within the rental segment come ﬁrst, then moves from the rental segment to the owner-occupied segment, and then moves with the owner-occupied segment, which are contemporaneous with the business cycle. With this recovery being one of the slowest in the post-World War II era, it’s not surprising that renting has done well. 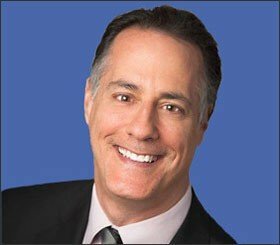 And with the greater amount of regulation and scrutiny applied to home lending, it has become much more difficult for those who want to buy to do so, which has helped the demand for rentals even more. 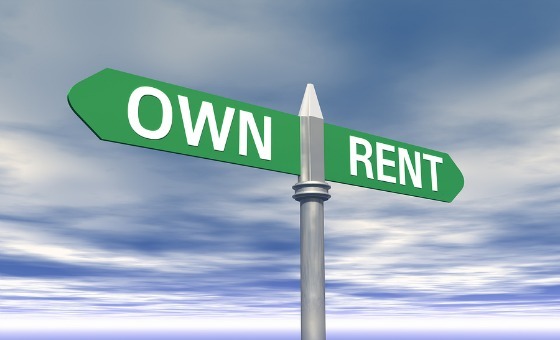 Has there been a sea change away from homeownership to renting or is it more of a factor of people’s inability to buy despite having the desire to do so? For this we turn to another Federal Reserve research paper called Why aren’t more renters becoming homeowners? It seems pretty clear from the surveys done by the authors that most people still desire to own homes. 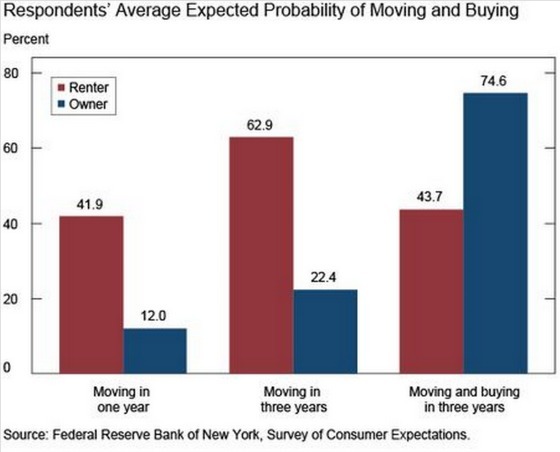 This first chart is interesting in that a meaningful percentage of renters planning to move in three years have a strong inclination to buy and those who already are owners overwhelmingly plan to buy another home during the same time frame. 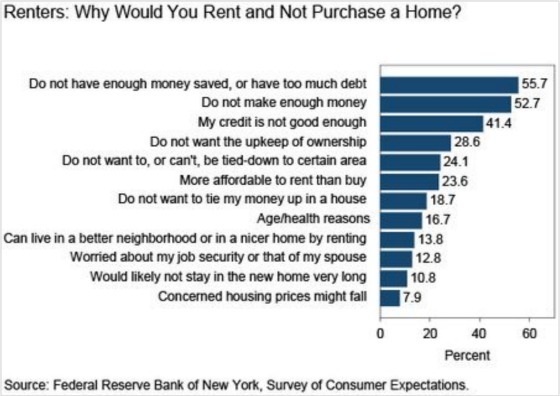 It’s pretty clear from the next graphic that the main reasons for those who remain renters to do so is that their reasons are either financial because they either don’t have enough money saved, too much debt, too little income, or poor credit (or a combination of these factors). 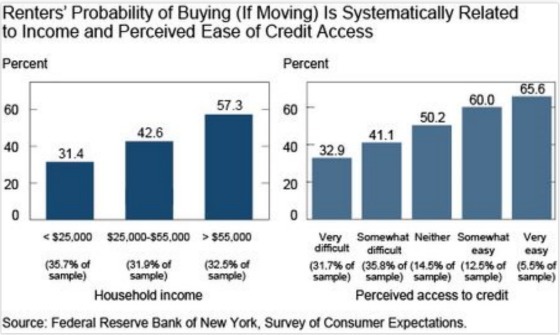 For those who are on the higher end of the income scale and perceive credit access to be somewhat easy or very easy, the probability of buying a home increases significantly. Finally, according to the survey by the authors, renters are also somewhat more optimistic about the trajectory of home prices over the next five years. Thus, when you put it all together, there is still a fairly strong desire to buy a home, renters are more optimistic about future home price appreciation than current owners, and those with the financial means seem to be preparing themselves to purchase a home in three years or so. The last five years have been very strong for apartment owners. We do believe that demand for apartments will continue to outpace supply because we still think there is not enough housing being built to satisfy the demand and the overflow will go to apartments. In addition, there is still value for people to retain flexibility to be able to move for their jobs plus all of the demographic and societal factors mentioned in a recent blog post. Nevertheless, with job growth remaining relatively healthy, confidence growing, and improved financial strength of higher income wage earners, homeownership will most likely offer strengthening competition and will be something we monitor closely.